Welcome to System Pics 2019. To start things off, here is a picture of my setup. The only thing that has changed since last year is the addition of a maple Fraim to match the speakers. Boy it’s that time again, guess we should be thankful to be here yet again. 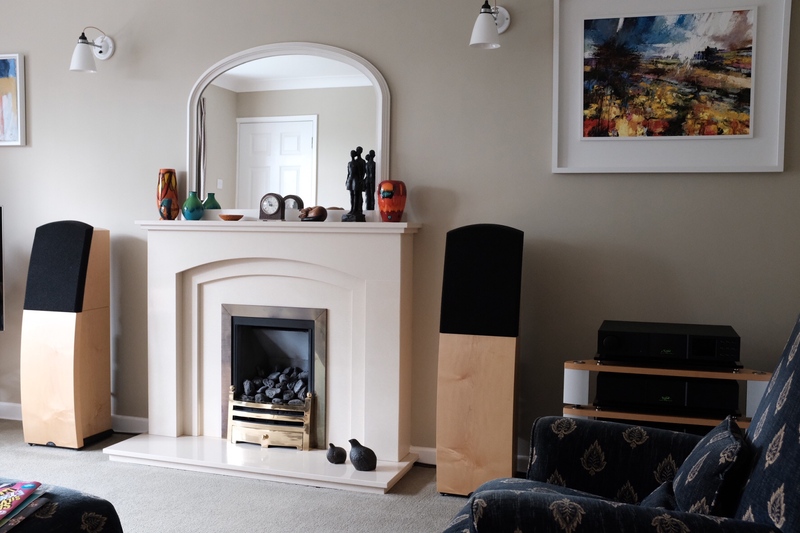 Still love the veneer on those speakers HH. Had a chat with my dealer lamenting poor veneers a few weeks ago. Much effort goes into “ almost printing identical” so called veneers, so each speakers looks the same. Just like last year lovely room and system, have a great Xmas and New Year. 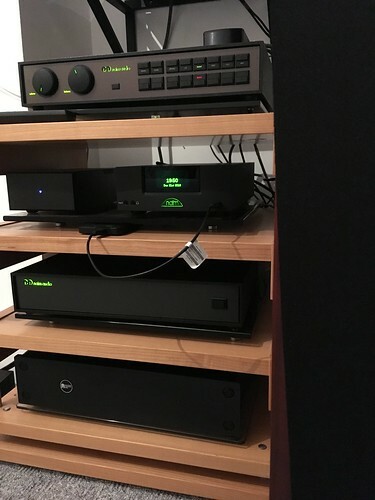 Since my last system pics post, Viotti One speakers have been replaced by the new Magico A3’s, and a 555DR power supply has been added for the 272 pre-amp/streamer. The speakers, ordered last March, finally arrived in September. Despite being a sealed-box design, they needed a bit of space and have been moved out from the wall as much as the wife would allow. They’re now fully run-in, and sound very nice indeed. After many months of searching, a reasonably priced 555PS DR was finally found in the “pre-loved” market a few weeks ago. I must confess, I was a bit skeptical about the improvement it would bring to my 272/250DR based system, but WOW – a big surprise and the best upgrade ever, thanks to guidance of members on this forum!! As before, afraid I’m stuck with the built-in shelving. Although I envy the elegance of HH’s setup, everything here works well together and no more changes are planned for a while. I’m poorer, but very content! Hi Bob -- great to see the A3's in situ! What do you have the spikes sitting on? Did you buy the grills? 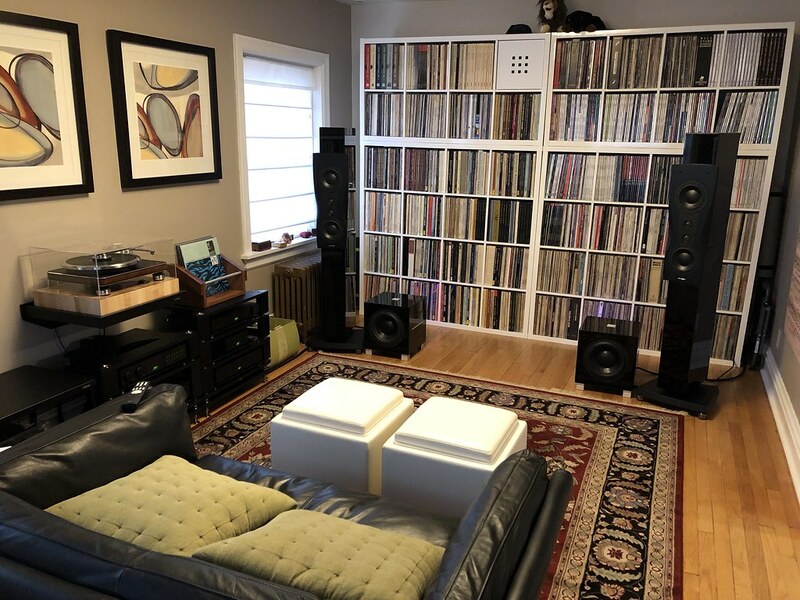 I'll refrain posting a system pic until I pick new speakers. The A3's are in the lead, but Kudos 606's are in transit for an in-home audition over the Christmas holiday. Hi Bart - Yes, I bought the speaker grills, but only use them when grandchildren toddlers are around. Unfortunately they do noticeably degrade the sound. The spike pads were provided by my dealer (Overture Audio in Wilmington) and I'm not sure who makes them. If you decide to go the Magico route I'm sure you won't be disappointed. Keep in mind though, they need a lot of run-in time, at least 200 hours or so! I’ll be posting mine later in Jan.
My humble system doing its thing. Urika replaced Stageline is the only change this year. Some heavy-duty socks there, Graeme. Very cosy. Yes, I do look a bit as if I have elephant feet! 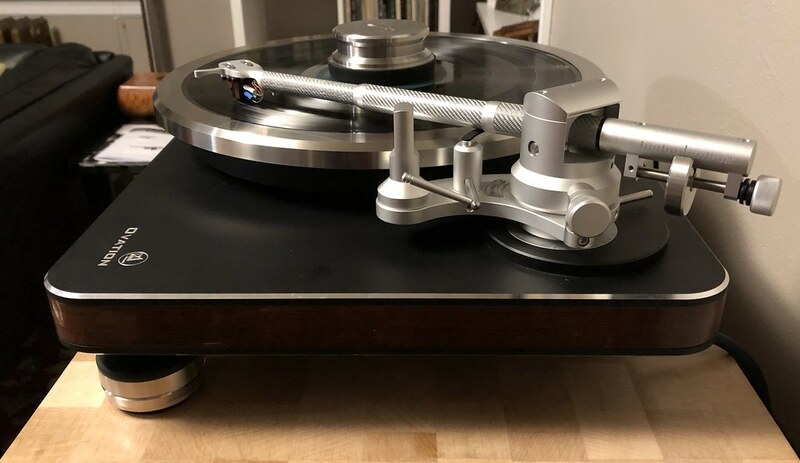 My final change for 2018 was to upgrade my TT with a new tonearm, the venerable Clearaudio Universal 9". 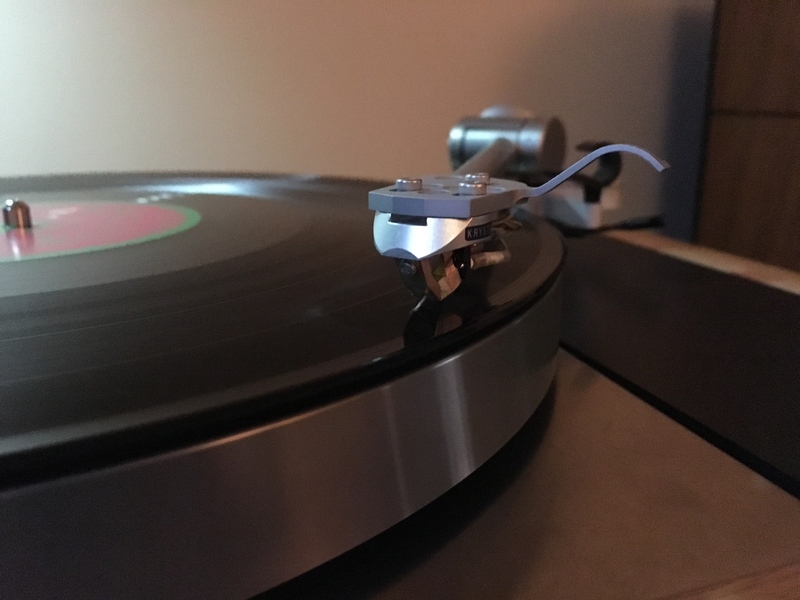 I can't understate how good this tonearm really is. It's like adding a better PSU to the system, or even better. It adds a lower noise floor, is more dynamic, has better grip on bass, and improves the focus on the soundstage. I should have done it years ago. The final result after all my massive upgrades in 2018. That's one hell-of-a record collection you have there, Racetripper. Impressive! Thanks! Oh, those are just my current playlist, LOL. Seriously though, I have more but not that many more. It's mostly acoustic classical (all of left side) and jazz (most of right side). It only took me 45 years to collect them. I like the art work. Who is it? 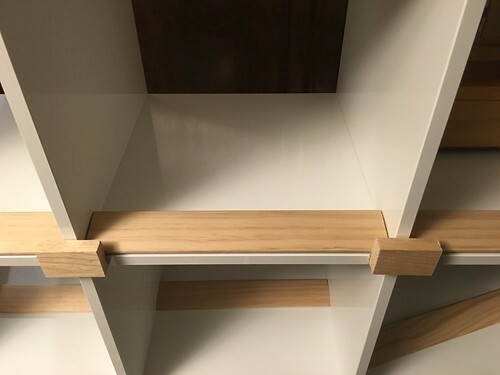 Racetripper - what are the vinyl storage units - some IKEA offering or a bespoke design? You mean in my room? We bought that from a local store, Crate & Barrel. We like how the shapes and colors reflect the theme of vinyl records and covers. Those are Ikea Kallax in gloss white finish. Two 4x4 units on the bottom and two 2 x 4 units stacked on top. I fashioned some stops on the backs of the shelves (to prevent pushing records through) by gluing wood blocks and using floor molding strips cut to length. 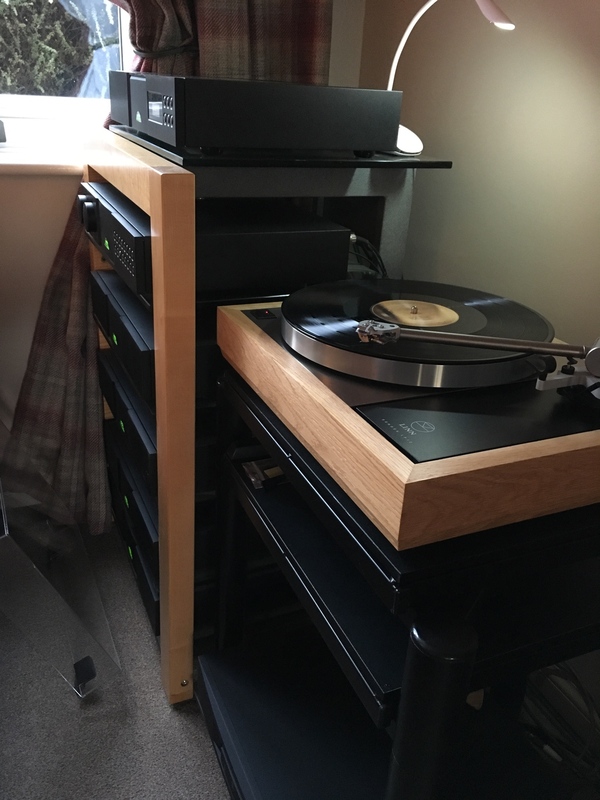 Awesome, thank you - I had looked at Kallax but didn’t like the idea of the records being so far back on the shelves .... the DIY stops that you’ve added, is a fantastic and simple solution. Thanks again, it looks really impressive ???? Yeah, I like my records almost flush to the edge. There's just about one cm, give or take a smidge or two on average, between record spines and the edge of the shelf. VERY nice! Are those Isoacoustics under your table, or Clearaudio products? To those of you asking questions - it would be great if you could post pictures of your own systems at the same time. It’s always nice to see some new ones. Don’t be shy!! 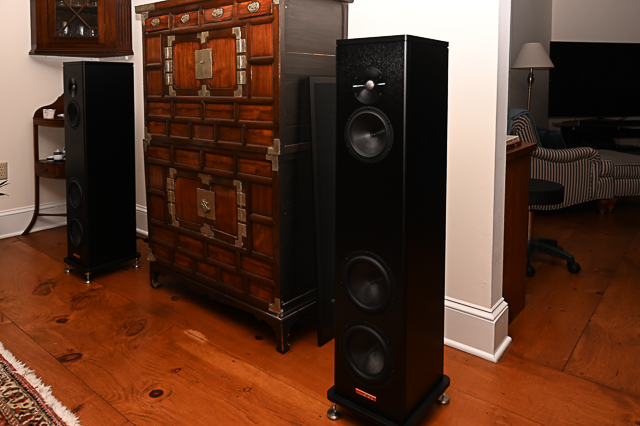 They are indeed isoAcoustics Orea Indigo pucks. I also have a set of Gaia III I am trying as TT feet as well, to see if one or the other works better. 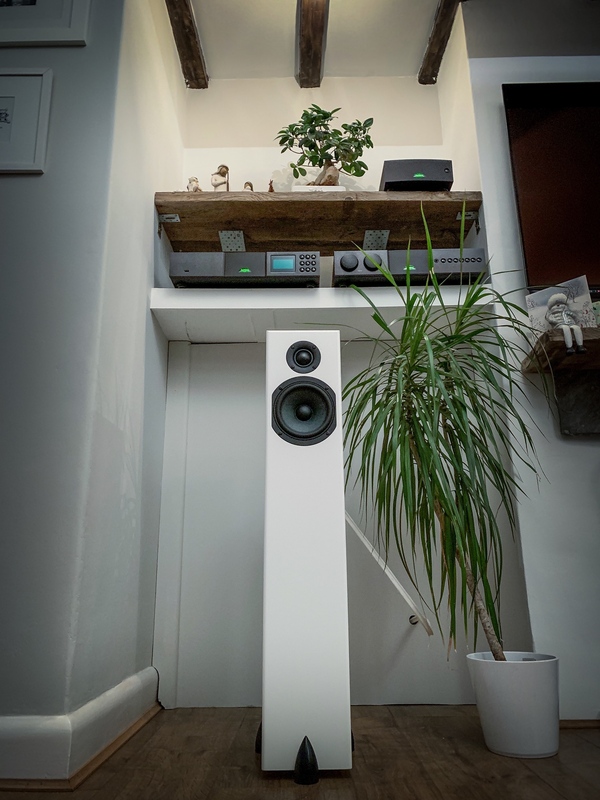 I also use the Gaia II as feet for my speakers. They work great. Our less than immaculate lounge, but the music is sounding really good. Brain on the left, top to bottom (Rega Aura phonostage, 252, 300). On right same order, RP10/Aphelion, nDAC, CDX2, 555DR, SuperCap DR, 300DR. 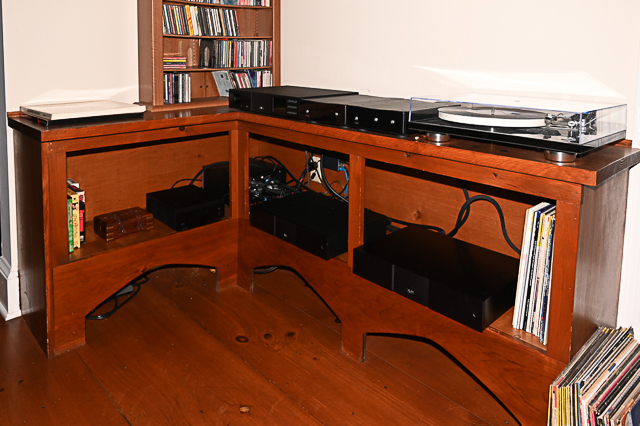 All electronic on Naim glass, cups and balls. It has taken 3 years to get this far thanks to the forum. We have plenty of soft furnishings. 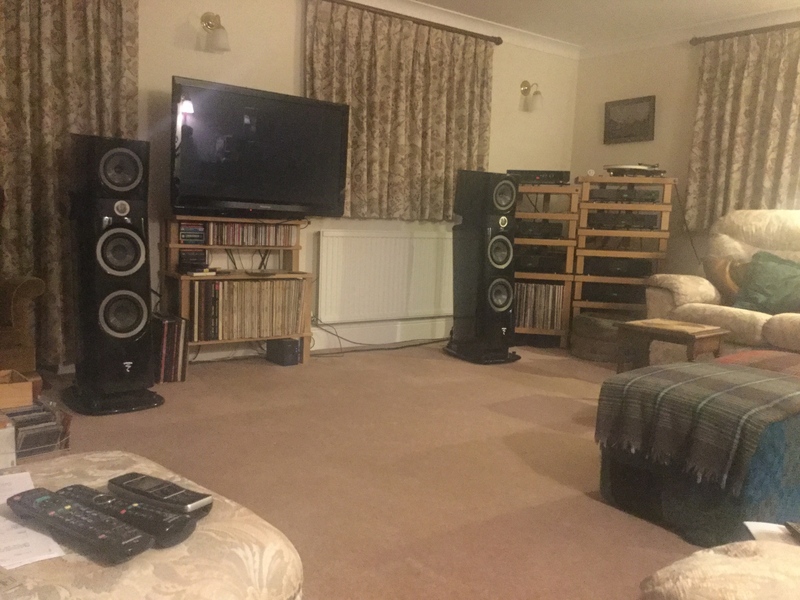 Speakers are now working well in the room. We sit either side of the fireplace which projects into the room 600mm approximately. Lots of windows and large doors. Two doubles not visible. 30 years ago I was building this 300 sq m chalet bungalow at weekends with the help of an almost retired brickie. Enjoying my few recent upgrades. Sorry iPhone picture again a couple of new editions unfortunately the WD passport doesn't seem to be compatible withe UQ2.